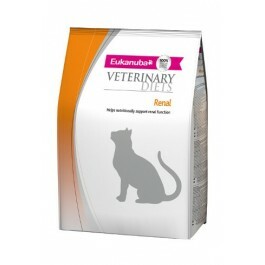 Eukanuba Veterinary Diets Renal for Cats is a complete dry food intended for the support of the renal function in case of chronic renal insufficiency. It is recommended that a veterinarian's opinion be sought before use or before extending the period of use. It contains a restricted level of high quality protein and a low level of phosphorus. Renal for Cats should be fed initially for up to 6 months - for any extended use please consult your veterinarian. Water should be available at all times. This diet will provide all the nutrients needed to support the overall health and well-being of your cat. A wet version of this diet is also available. Feeding Instructions: It is recommended that a veterinarian's opinion be sought before use or before extending the period of use. Your veterinarian may suggest specific feeding instructions for your cat, or ask you to follow the standard portions shown in the feeding chart. Recommended time for use: Initially up to 6 months. Lifetime feeding is possible under supervision of a veterinarian.